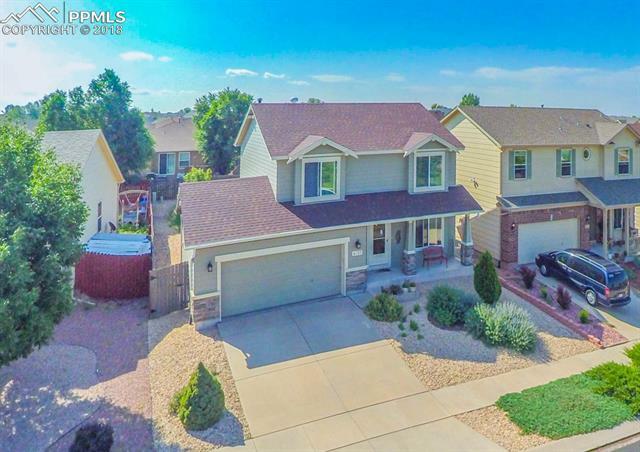 Cute 2-Story home in Soaring Eagles with Pikes Peak views from the front of the home. Immaculate condition with wood flooring, laundry room and half bath on the main level. Upstairs there are 3 bedrooms including large master with great views and beautiful master bath with soaking tub. Downstairs there is a large rec room with wet bar. The basement offers a half bath with room for a shower to be added at a later time. Fenced yard and school across the street. Must see video.